The cliffs on the W side of Cilan Head extend for over a mile and it is very difficult to identify individual crags from above. To help a bit, GPS references have been given for all approaches / abseil points to each cliff. Crags to the N of Zawn One are most quickly reached from the parking spot near the farm of Pen y Mynedd. Crags from Zawn One to the tip of the point are best accessed from Cilan Uchaf (as for Craig Dorys). For negotiating the steep grass slopes above the cliffs it is advisable to wear substantial approach shoes with a good sole (rather than worn trainers). Generally a low-angled and stratified cliff but the rock is sound, there are good belays all along the clifftop and no scary slopes above the climbs. Amazingly for Cilan, a good area for beginners! On the tip of the headland is an easy descent to sea level then traversing southwards (away from Hells Mouth) takes one beneath many climbable lines, many of which have been done. As it swings into a shallow zawn/corner the cliff gets more impressive and consists of a barrier of overhangs above a big ramp dipping down rightwards to the sea. There are numerous ways to gain the ramp from V Diff to VS (40ft). At the left end of the big blank roof above the ramp a disjointed groove breaks through. Start 20ft left of this at another weakness. Climb a shallow groove to a horizontal break, move right and up a series of more pronounced grooves to the top. Scramble easily down the broad tip of the headland to sea level and traverse easily southwards until smoother rocks are reached. Above is a steep band split by a short, right facing corner giving pitch 1 of No Parrots (Wild Goose). Above this a huge ramp descends from the clifftop and in big seas / high tide it is easy to access the upper (main) part of the crag by descending the ramp and belaying near its base. A good route with fine positions, but you do have to hunt for protection on pitch 2. Start as for No Parrots (Wild Goose). 1 60ft 4b Move left up a ramp to an obvious groove. Climb this then traverse up right to belay on the big ramp. 2 80ft 4c Above is an open bay below a large overhang. Gain this from the left, move right beneath the roof then climb the wall above via some good cracks to reach easier ground. A very good route, once located! 1 60ft 4c Move up and climb the right-facing corner then bear right to belay on the big ramp. 2 130ft 5a From the RH end of the ramp, climb boldly up the compact wall to good holds and runners below the overhang. Traverse R into a groove and follow this trending slightly rightwards to reach belays (Friends 3 & 3.5) in a wide crack on the clifftop. 1 70ft 5c Step up then traverse R below the overhangs around a rib into a smooth, R-facing corner which leads to the lowest point of the big ramp. 2 70ft 5b Follow the gently descending traverse line for 35ft. Climb up R-wards then back L to gain the groove. Move up to a good stance after 10ft. A serious pitch. 3 100ft 5b Follow the groove and its continuation to a ledge with block belays. Walk off L.
The second zawn to the N of Trywn Carreg y Tir is named after the impressive sea-cave at the back which booms like a cannon in the swell. A pleasant cliff having a lot of good quality, frictional sandstone. Gets sun in the afternoon. Approach: descend the second small headland to the N of Trwyn Carreg y Tir and traverse S-wards into the zawn (possible at low to mid-tide). The first good feature is an obvious, slabby groove. 10ft beyond its base is a projecting ledge above HT mark – belay here for the next 2 routes. A fine outing for a competent party; not too steep and mostly on good rough sandstone. Take a full rack of gear. 1 100ft 4c Move up and follow cracks which trend R to the Rh end of a long roof. Climb quartzy cracks above then move R and follow some grooves to a large sloping ledge. 2 120ft 4b Traverse up R across a bubbly wall then follow a line trending R-wards past a huge block, finally reaching the grass slope. Belays well back to the L.
Good climbing and rock solid. Start as for Longshot on the projecting ledge. 1 120ft 5b Traverse right for 30ft rising very slightly, then climb diagonally R towards a downward-pointing overhang. Pass this and continue in the same line to reach a ramp which is descended to belay nearly at the sea cave. 2 90ft 5b Go back up the ramp for 30ft and climb past the bulge just R of a perched block. Trend R-wards to some bulging overhangs and pull through these in the same line to belay in a break just below the apparent top. 3 70ft 4a Up a short groove then climb L-wards up the steep slope to reach various rock belays. This is the prominent headland which encloses the bay of Chinatown to the north (lets define Chinatown as the main back wall of the bay, above the two sea caves). 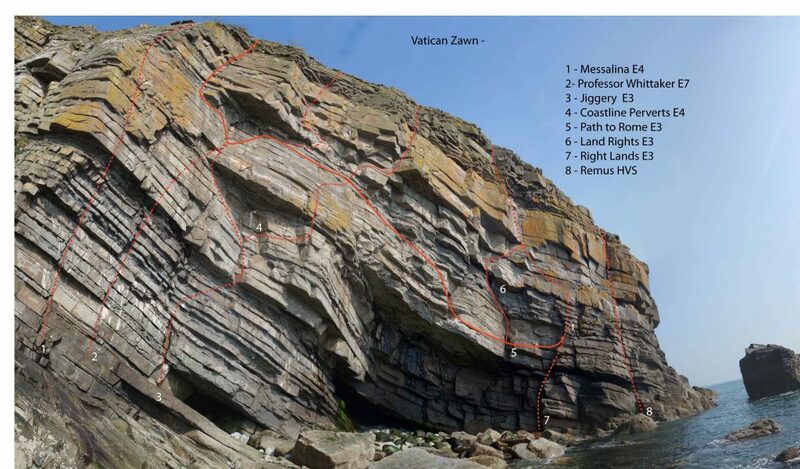 The following routes are on the south face of Trwyn Carreg y Tir, which extends from the point to the entrance of the northern sea cave. The cliff looks uninspiring at first but offers worthwhile climbs which are less serious and more easily accessed than most others at Cilan, and also possible at most states of the tide. Being south facing and in a sheltered bay it is a good winter venue. From the bottom of the slabby descent rib (beside the chimney of Spike’s Route) traverse towards Hells Mouth for 100ft till below an obvious break in the large roof. Climb straight up through the break and the groove and slabs above. Good climbing on solid rock all the way, and accessible at high tide. It takes a rising rightward traverse from Spike’s Route to exit at the corner of Storm in a Teacup. Two lines break out of Spike’s Route – the lower is an easy-looking ramp which leads to unprotected ground; the upper is a crack line leading to an obvious niche. 1 80ft 5b Move up to the start of the crack, gain a spiky ledge then swing down and follow the crack line to the niche. 2 100ft 5b Move right and follow a horizontal crack across bulging rock to better holds. Step down and continue traversing, past a blind corner, finally reaching the corner of Storm in a Teacup which is taken to exit. Pleasant climbing on excellent sandstone. From the chimney of Spike’s Route traverse right for 30-40m till below a distinctive corner line – belay below it. Climb steeply past a big spike to reach the corner, which is followed to the obvious leftward exit. Roughly midway between the corner of Storm in a Teacup and the sea cave which terminates the crag is an obvious stepped weakness heading up rightwards. (This is about 30m before the start of Blue China.) Belay below this. 1 80ft 5b Follow the break to join Blue China at its stance. Climb the bulge above as for Blue China then break right over an overhang and up to a belay ledge. 2 20ft Easy ground to the top. Descend the slabby rib (as for Spike’s Route) and traverse into the zawn (low to mid tide) until just before the big sea cave in the back (N) corner. Above is an obvious leftward-slanting ramp. 1 80ft 4c Gain the ramp and climb it to a decent runner at 50ft. Continue to a stance below overhangs. 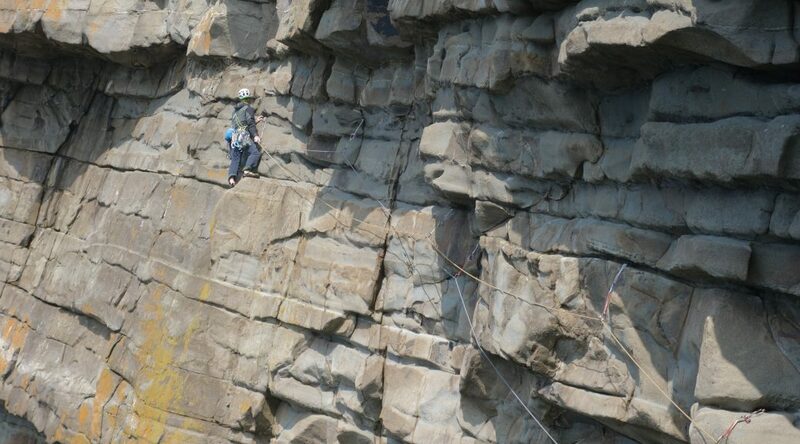 2 40ft 5a Follow the ramp to another ledge (old abseil gear) and continue steeply in the same line to the top. A handy little route, non tidal and on good rock. Climbs the little cliff above the first zawn immediately S of the tip of the point. Start at the obvious groove. 1 50ft Climb the groove till it steepens, move R along the shelf and up to the sloping ramp. Move L to good belays above the initial groove. 2 50ft 4b Follow the obvious stepped weakness R-wards. Belay where the rock ends then scramble to the clifftop. Approach is possible for about 3 around Low Tide. Descend the ridge of Trwyn y Fulfran to slabs at sea level. At dead low tide boulder hop across the first inlet, or pass it by climbing to the obvious ramp (as for Sundown) above the inlet and descending it to a small zawn (HS). A ‘needle’s eye’ and a traverse across slippery slabs leads to the boulder-filled cove below the awesome northern sector of Paitsh. Climbs the great yellow spur which divides the two sectors of Paitsh. The easiest ‘XS’ on the Lleyn but still a committing expedition in impressive surroundings. Start at the southern end of the boulder cove, beside the spur. 1 80ft 4b Make a gently rising traverse on incut holds to the big sloping promontory at the base of the spur. 2 100ft 4b Climb the buttress to a steeper band of more compact rock. Good belays at cracks on the L.
3 70ft 4c Step up then climb diagonally R to stand on the obvious block. Move up then R-wards again to reach a big sloping slab. Single (good) nut belay. 4 100ft 5a Wander rightwards to reach a short steep groove. Climb this then the compact slab on the R to ledges and high belays in a corner crack. 5 50ft 4c Escape leftwards up the ramp – loose and thrifty. Rabbit hole belays up to the L.
There are two abseil stakes above the finish of path to rome. You will need a very long rope (100m+?) to get from there to where you need to abseil to get to the non-tidal start of Path To Rome. There are some wires and cams to right a belay closer to the point, but you need imagination and a little bravery. An alternative start to Right Land’s. Start from the base of the abseil that would otherwise get you to the starting ledge on Path To Rome. Climb the easy groove to the ledge Path to rome start from and carry on up the wall on the right of the groove. Step up onto the wall and gain the lower break and traverse this left to the triangular roof. Strenuous moves round the right side of this gives access to the upper groove of Land Rights. Move up this and exit left onto a nose where the rock starts to deteriorates. Head up broken ground to the top. This is a rough too. I suspect the lines are wrong, please contact us here so I can straighten them out. For instance Land Rights is suppose to go 30ft to a niche, whereas Path to Rome goes 60ft to a niche. I have seen someone climb Land Rights via the 60ft so not sure.